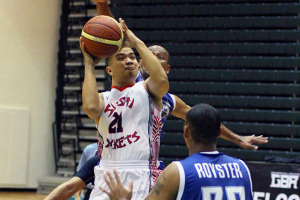 The Sushi Rockets earned a valuable win Sunday evening in the GBA after overcoming a legal comeback from Team Justice. The Rockets dropped Justice 86-74 and improve to (2-0) after the season’s first weekend while Justice falls to (1-1). The Auto Spot Phoenix Sons defeated the UOG Tritons 86-75 in the earlier game and the MVP Stars narrowly defeated the Camacho for Congress Four Stars 93-92 behind another 38-point outing from GBA’s leading scorer guard JP Cruz. Earvin Jose led the Rockets with 20 points and seven assists and teammate James Stake added 17 after the team’s once 17-point early 3rd quarter lead dwindled down to just a 60-54 lead with two minutes left in the 3rd quarter after a rebuttal from Team Justice. Jose converted on a layup along with teammate Kurt Long in the final minute to hold on to a 64-57 lead heading into the final period. Stake then took over in the opening minutes of the final quarter by knocking down a corner three pointer for a 67-59 lead. Stake then served Justice a well-done four-point play while taking a hack on the release of his nothing-but-net three pointer for a 71-59 advantage. “We have a lot of shooters on the team so when we feed it to our big guys we try and space the floor out and we try and make them pay from deep, which is the best way to fight their zone,” added Stake. The brief takeover by Stake was enough to open up the flying lanes for Jose, Long and the rest of the Rockets to takeoff. 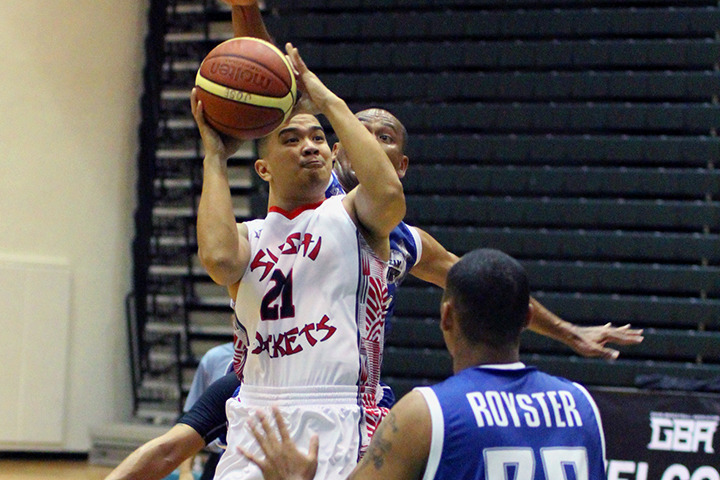 Jay Casimiro scored six points down the stretch for Justice but the lead proved too large with the Rockets getting a nail-in-the-coffin three from Jose for the 86-74 lead in the final minute. “[Justice] has been playing together for years so you can never count them out. That’s how good they are and that’s how much we respect them. But, if we can stick to the game-plan and not lose control or composure then I always see us coming out on top,” said Jose. Justice’s Reggie Rechebong had a strong 3rd quarter where he poured in 14 points to bring his team back from the 17-point deficit after scoring 24 points in the 4th quarter to pull away from the UOG Tritons the night before. After a quick (2-0) start in the GBA the Sushi Rockets have learned a wealth about their team and from the starters to the bench. “We’ve learned that we’re very versatile and we have a lot of weapons on the team from our guards to our bigs. Anyone of us, one to fifteen, could start for us and everyone who does see the court comes in with a lot of energy,” said Jose. GBA action continues Wednesday with Justice playing the MVP Stars at 6 pm and the Sushi Rockets facing off against the Camacho for Congress Four Stars.